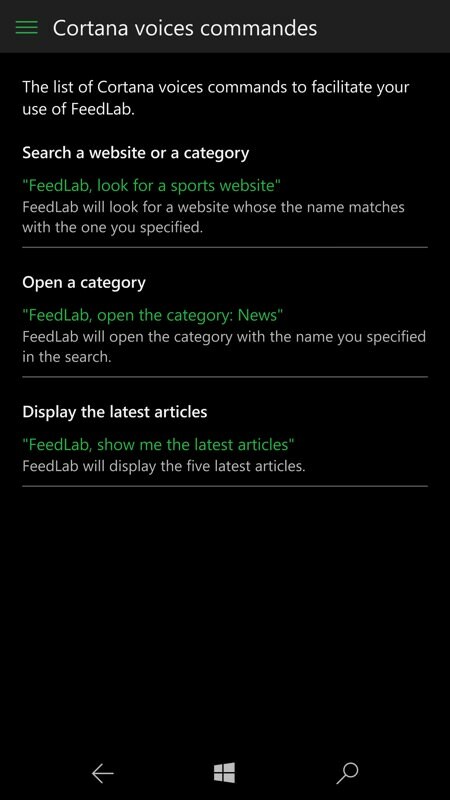 Back in the summer of 2015, I looked briefly at a new Feedly-compatible news reader for Windows Phone 8.1 - FeedLab looked very promising, perhaps too feature-packed for its own good compared to the simpler Nextgen Reader. Fast forward 17 months and we have a new, totally reworked FeedLab, now a full Windows 10 UWP app, looking great on the phone, on Continuum displays, on tablets and laptops, even on Xbox. 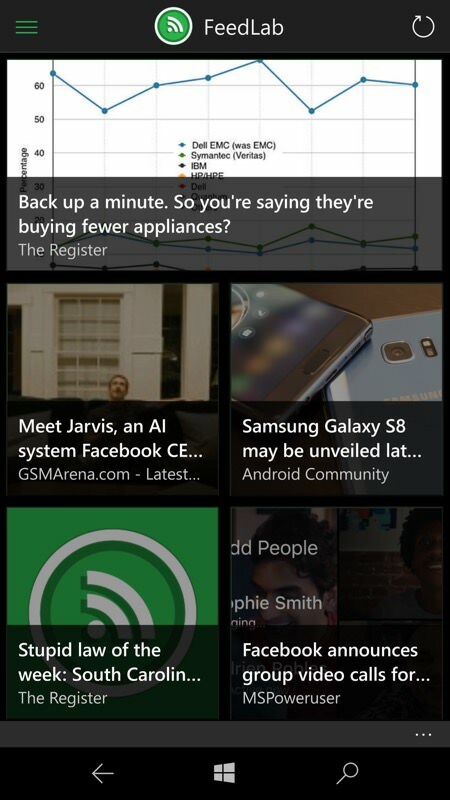 If you want a New Year's resolution for 2017 then how about you grab this and take charge of your Feedly news on Windows 10 Mobile? If you're new to RSS, Feedly and news aggregation then you've got a small learning curve ahead of you - but it's worth climbing. Top web sites around the world publish their content via RSS, a machine-readable text-based system that can be queried by any application or user on the Internet. Now you could use a client (e.g. this old one) to access all this directly, but it's very bandwidth and time-intensive. Better is to make use of a news aggregator like Feedly - a web-based service that does all the polling and checking for you (potentially across hundred or even thousands of web sites) and your only involvement is to check Feedly itself for new headlines. 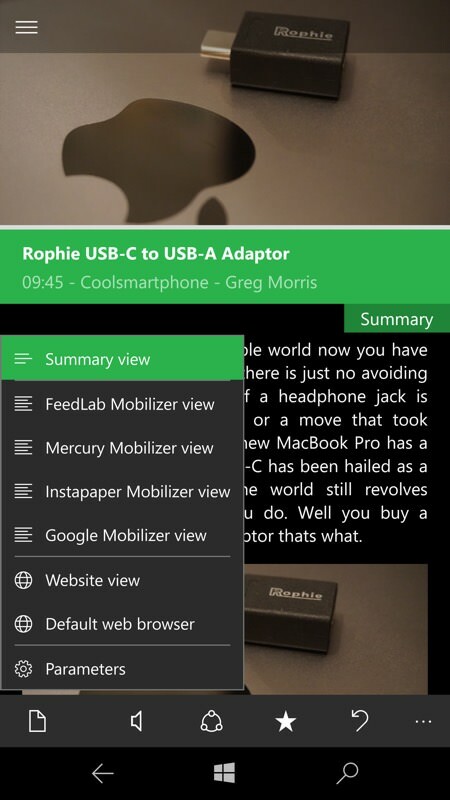 Now, you can use Feedly in a web browser like Edge on Windows 10 Mobile, but far better is to use a dedicated application that presents the Feedly headlines and story summaries quickly and attractively, managing your interaction with the service. If this all sounds over the top to you then note that, once set-up, you can be right on top of news as it happens around the world. You might prefer the quick-fix of Twitter or Facebook, but for professionals (like me!) 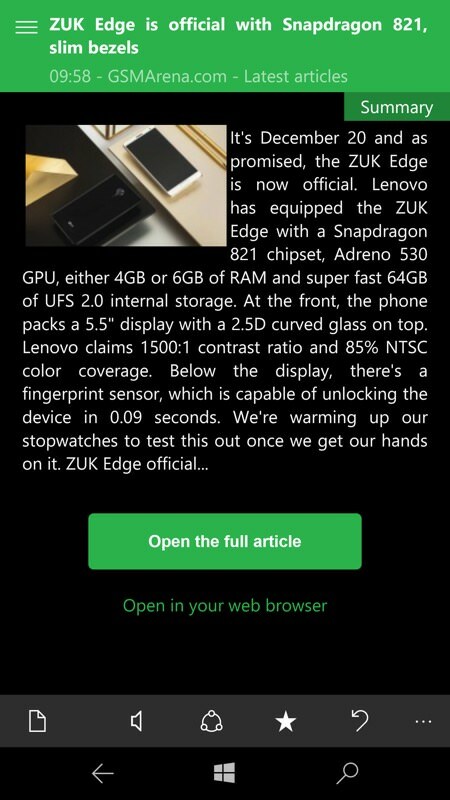 who want more detail then Feedly works brilliantly. 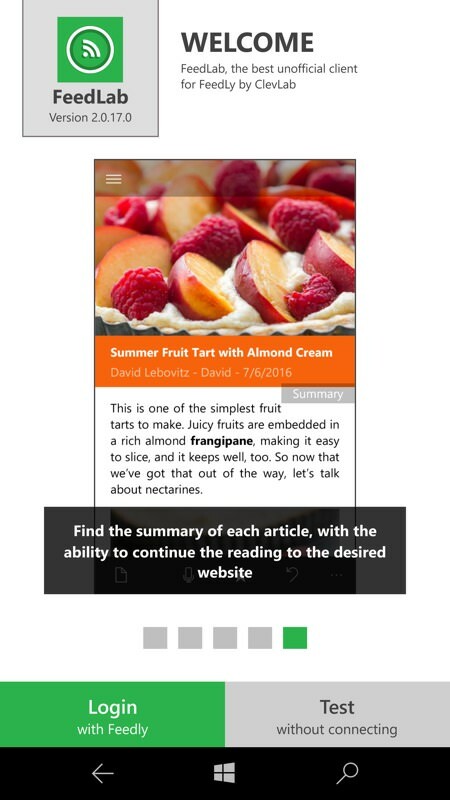 At which point we come to FeedLab, a new UWP application that knocks the whole concept out of the park, especially on larger-screened phones. More customisable: settings have been enriched and reorganized to allow the user to configure FeedLab according to their usage, including the choice of home page, theme and article display, etc. It all adds up to a major update and I have to say that I've been very impressed. 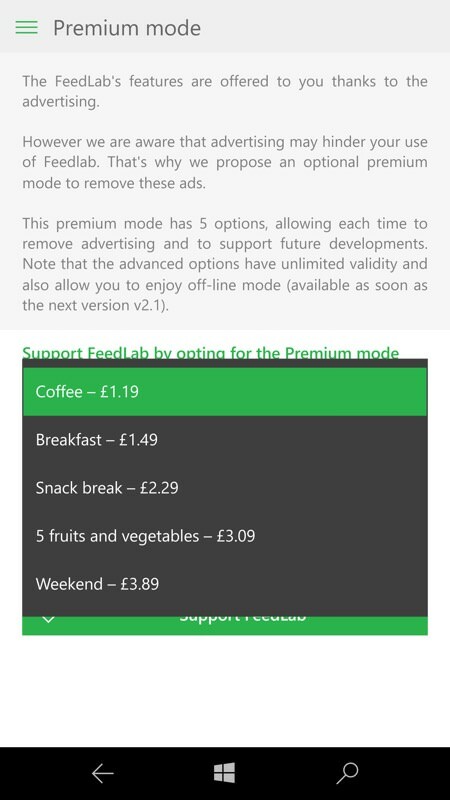 FeedLab is free to download, with ads in the interface that you can pay to remove (and also enable a full offline mode) - there's some granularity in the in app purchases, allowing you to donate more if you want to support development. And good news for existing users is that the (bought) in-app purchases in the Windows Phone 8.1 version are still applicable in the new Windows 10 version. The overall workflow of FeedLab hasn't changed much since that early (8.1) version in 2015. There's still the useful set of graphical overview panes introducing what FeedLab does (essential for newbies - which is partly why I had to do some explaining above!) and then you're into logging in with Google, Facebook (both via OAuth) or using a dedicated Feedly account. 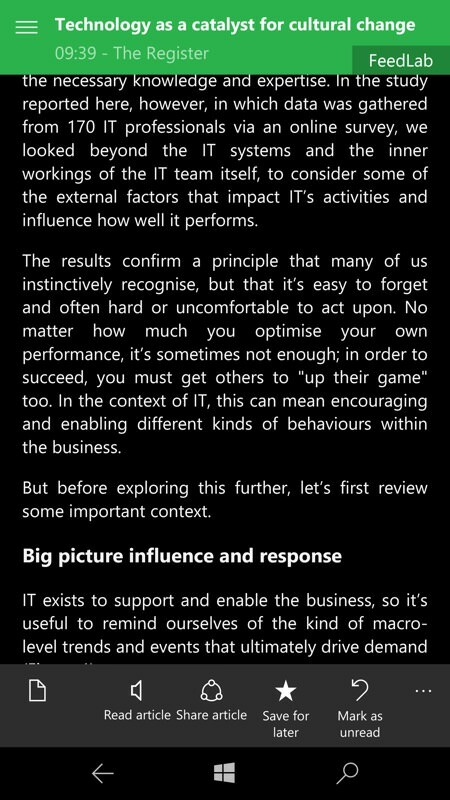 The default is for a pure white theme - all very pretty but a battery disaster on all the flagship Windows phones with AMOLED screens, but thankfully there's a true 'Dark' theme, where in virtually all content other than graphics is white-on-black. 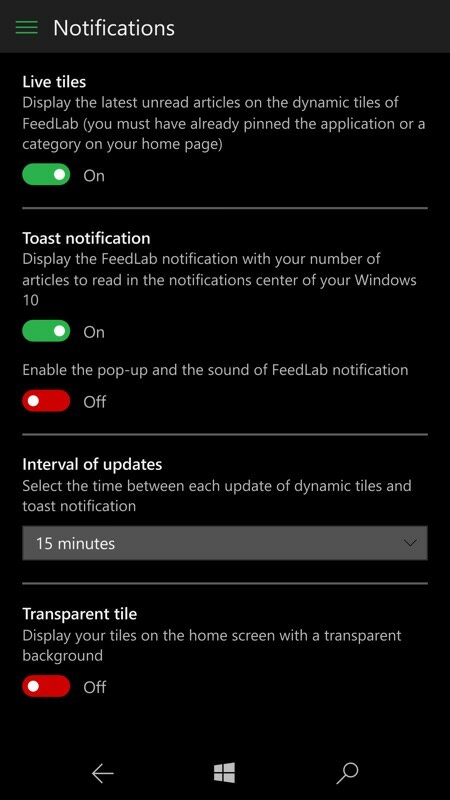 You do have to make sure that FeedLab is genuinely relaunched to pick up the new theme though - this usually means restarting the device or, better, killing the app from the W10M multitasking panes. The workflow is pretty typical of a news/feed reading application - browsing headlines (and summaries, depending on templates and view chosen), you pick one to see the text content from the site's Feedly-gathered RSS feed. This is usually just a paragraph or two, mainly to keep the size of RSS files down on each site but also so that you're forced to click through to get the whole article - which is where most web sites get their funding, via ads, of course. 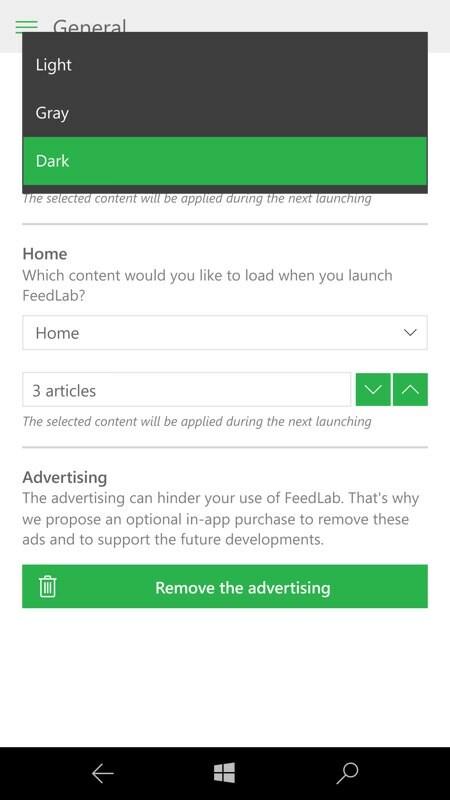 In fact FeedLab goes further, with a number of scrapers/'mobilizers' available, each doing their best to preserve as much of each story's original content while keeping bandwidth down and ads/peripheral content out. See the pop-up list in the screenshot above, left. 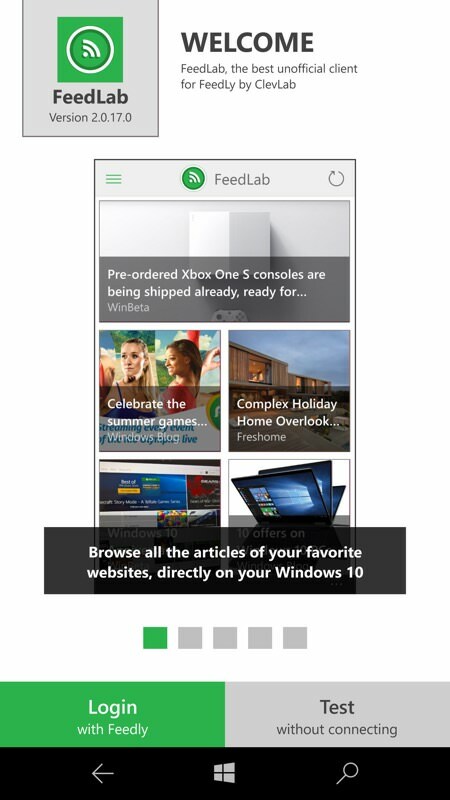 Now, you'll have noticed that FeedLab was a free download in the Windows 10 Store. And you'll have noticed that there are no adverts shown in these screenshots - by default you get unsightly banner ads and the very first thing you should do is use one of the in-app-purchases (IAPs) to remove these. This starts at £1.19 (in the UK), so isn't going to break the bank, though the recommended purchase is £2.29, helping to reward the development team. 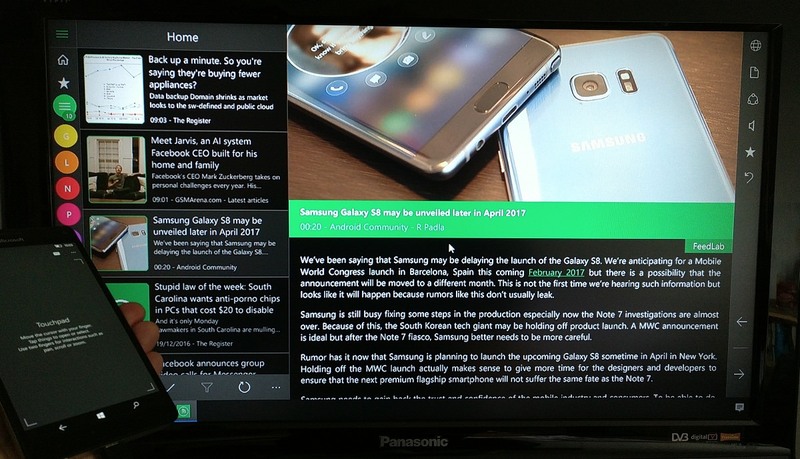 The higher IAPs also fully enable 'offline mode' - or at least they will when FeedLab's developers finish writing the code to enable this ('offline mode', as the name suggests, lets you browse headlines and summaries even while disconnected and the stories that you mark as read will get marked as read on Feedly when you're next online again). FeedLab's options are comprehensive. Which is good, because everyone has a slightly different way they'd like news/feed readers to behave. For example, I like any headline and summary I've viewed to be marked as 'read' on the Feedly server so that I never have to see it again, while other people might like to use the phone view here as a browser for interesting stuff but still want the full set of stories available later on another device, or even on the web. You also get to choose whether you want to be reminded in Action Center of stories that are waiting to be read. 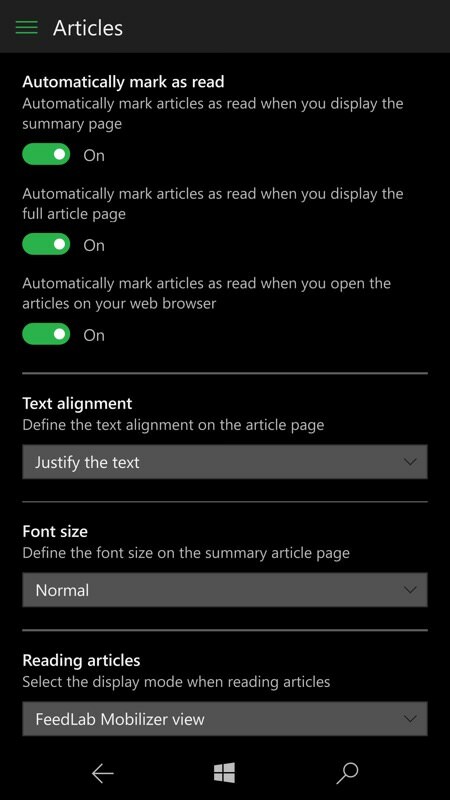 Finally there are font display options, though I found the default to be perfect with my eyesight on the Lumia 950 - you might need to tweak things on much smaller or larger displays. Also shown (above, right) is something that FeedLab's developer are proud of, the Cortana integration, though I can't imagine anyone using this in the real world - surely it's ten times faster to just tap the live tile or a shortcut and go from there? On the phone, anyway - maybe voice control makes more sense when using this on an Xbox or Surface Studio or Hololens! 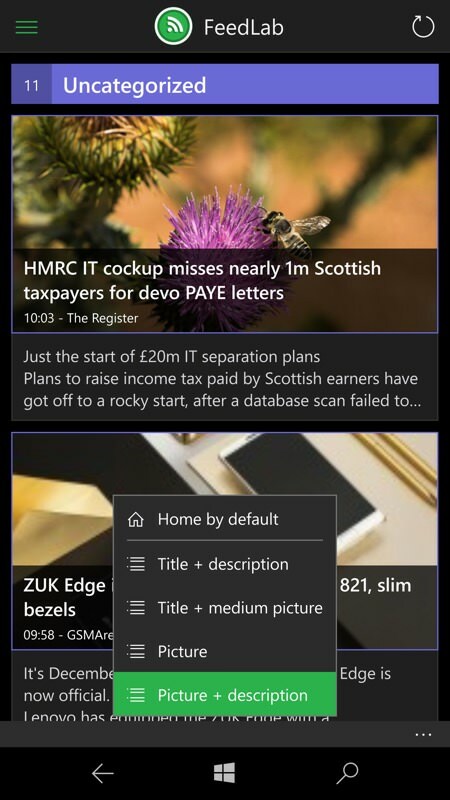 Very impressive - and thanks to the developers for reminding me of this rock-star Windows 10 Mobile application, I honestly hadn't realised that it had transformed so far from its humble WP8.1 origins. PS. We also have five 'Snack Break' promo codes to give away. Reshare this article via Twitter with the hashtag #feedlab-aawp and I'll pick five winners at random from the submissions in 24 hours time.